They have already won the approval of the likes of Jessie J and Dizzee Rascal and are supporting Professor Green on his tour later on this year. 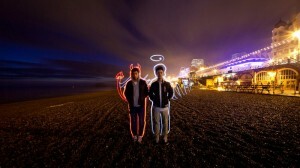 With their De La Soul-esq fun, fresh hip-hop style causing a stir in the charts, Rizzle Kicks made time in their hectic schedules for a quick chat with We Love Brighton. S: You guys are hard to pin down! What have you been up to today? S: Kebabs at 3 o’clock in the afternoon? Usually kebabs are reserved for 3 o’clock in the morning? RK: Yeah, but there’s not much about up here. Kebabs aren’t the one really though are they? S: Mmmn…When does the new album come out? RK: (Excitedly) at the end of October! RK: Very excited. Very, very, excited. It’s an outstanding album by our own standards; we just hope it goes down well, we’re very happy with it. S: Did you ever dream for one minute that ‘Down With the Trumpets’ would be so successful? RK: That’s completely what we try and do, just you know, wicked sounds and happy, happy vibes. We didn’t force it, we just wanted to do something that we loved. We’re totally in to De La Soul, Tribe Called Quest, all those vibes. S: Well it’s worked! Congratulations! RK: Thank you very much! How are you finding the overall reaction to everything? Is it still a bit of a whirlwind? RK: To start with we were both really confused; we just didn’t know what was going on. When ‘Trumpets’ first got in to the top 200 we were like ‘yes!’ and celebrated immediately. Then soon it was in the top 100, then the top 90 and we were like ‘WOAH this is mad!’ Then it hit the top 50 and we were like ‘sh*t!’ Then it went from 44 to 22, then 22 to 19, then 9 to 8. By then we didn’t have any energy left to celebrate again. S: You’ve already won the support of the likes of Jessie J and Dizzee Rascal which is pretty awesome and you’ve been working with our local talent Mr Norman Cook. How’s it been working with him? RK: It’s crazy. We used to dream about working with certain producers. Literally one week we were talking about him and saying how cool it would be to work with him and the next week we were meeting him in a hotel in Brighton. It was like ‘sh*t!’ It’s amazing to have the opportunity. Working with him in the studio is pretty great as you can just imagine how many band members have worked there and all the parties! S: So Rizzle Kicks have been together for two years? RK: Yeah we were about 16/17 when we got together. Wow it’s all happened fast then hasn’t it? Extremely fast! Have you been friends for a long time? We’ve known each other for a long, long time, since we were really young. We lost contact for about 9 years but then we moved to Brighton at the same time. Knowing each other so well is good, we’re not just one of those bands that have been put together, it feels really natural. We just started making music but didn’t really think we were doing anything out of the ordinary and next thing you know, we’re in the Top 10!! RK: We both lived in Brighton between the ages of 10 and 19. Because most of our work is now in London though we’ve moved up here because it’s much easier. We did try commuting for awhile, but getting the train everyday is hard and expensive! S: Do you miss Brighton? RK: Well our formative years were spent in Brighton. We learnt a lot of things there, it’s our home. It’s a really accepting place, you never walk around the streets and feel worried or anything like that. It’s a cool vibe and literally a breath of fresh air. As soon as you get off the train from London I swear the air is genuinely refreshing. It’s also nice that we have our established fan-base in Brighton. People know us as being Brightonians too which is wicked. S: Any top places to go out in Brighton? RK: The usual scene… Digital, Life, The Pav Tav! We haven’t been out in Brighton for awhile, but we’re doing a gig at The Green Door store at the end of this month which should be fun. S: The tickets are sold out! There are a few left on the door though..
S: That your gig is sold out? S: That’s very humble of you..
RK: Well it takes a lot to buy a ticket for a gig! So for people to actually do that for us (pause) aww, it’s so nice! Actually last time we came down we were at Brighton station and we had so many people come up to us and say ‘hey’ and ‘congratulations’, it was really lovely. S: So the album is coming up in October… what’s next for Rizzle Kicks? RK: Well before that we’ve got out next single coming out called ‘When I Was a Youngster’ which samples The Clash which is cool. It’s about all those dreams you have when you’re young. We’ve got the album and we will support Professor Green on his winter tour. We’re also playing Reading, Leeds and Strawberry Fields which will be awesome. S: Which would you say is best gig you’ve done so far? RK: Ibiza Rocks, definitely. Just to be there in the sun on stage having fun, doing what we love. It was the best couple of days of our lives. S: Is there anything you want to say to our Brighton readers? RK: You’re all wicked and amazing and Brighton is the best place to be. Thank you for everything. 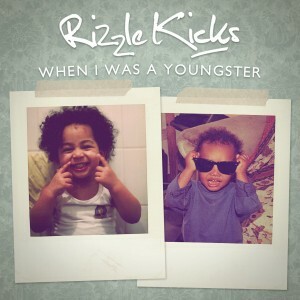 Visit the Rizzle Kicks website for more information on live dates and tickets.